The opening of The Hurt Locker is a textbook example of how to use images not only to impart information but to brand it on the brain. 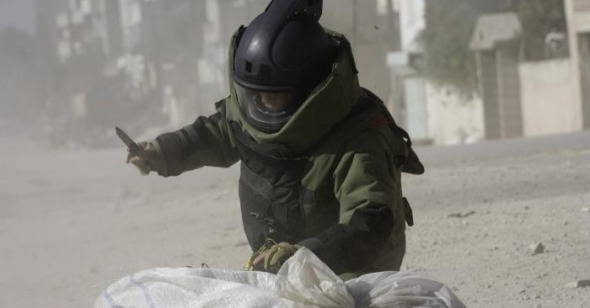 The scene has words, too—quite a lot of them—but none as clarifying as the sight of an Army bomb disposal expert (Guy Pearce), encased in a bulky protective suit, crouching before an active incendiary device on a sweltering Baghdad street. What happens next should be seen, not divulged; but from those first, horrifying minutes of expertly choreographed visual provocation we learn at least two things. First, that in the world of director Kathryn Bigelow, being a recognizable celebrity is no guarantee of longevity. Second, that hi-tech clothing can protect your flesh but war kills most efficiently from the inside. At no other point in the movie is this overarching theme as powerfully, or as succinctly, expressed. It’s hardly a new notion, but Bigelow comes at it with an improbably fresh eye: “subtle” may seem an odd compliment to pay a movie so immersed in violence, but the director’s methods—so vested in the visual—have no patience for preachy speeches or angst-filled monologues. Not for her the soul-searching conversation or guilty confession, the redemptive climax or message-laden bombast so common to war movies. Indeed, for anyone weary of the Iraq War drama (or documentary, or HBO miniseries, or Lifetime soap opera), The Hurt Locker feels both novel and emotionally honest in a way that has nothing to do with war and everything to do with human adaptability. Working from an episodic screenplay by journalist Mark Boal and based on his own experiences embedded with a bomb unit in Iraq, Bigelow immerses us in the quotidian tensions of a three-man disposal team with 38 days left on their tour. (The movie is structured in segments tagged with the number of days remaining, a time clock ticking down like a slow fuse.) Again and again, wild-card Staff Sgt. James (Jeremy Renner), by-the-book intelligence officer Sanborn (Anthony Mackie), and get-me-the-hell-out-of-here Specialist Eldridge (Brian Geraghty) patrol the dusty streets of their sector with every sense on high alert. Though essentially plotless, the movie maintains an atmosphere of perilous uncertainty that’s amplified when James, the new guy, reveals himself as an obsessive and seemingly fearless risk-taker whose balls-out behavior threatens the team’s carefully calibrated safety protocols. Experienced and intuitive, James sniffs out buried death like a trained retriever; he appears to have nerves of steel, and you’ll need the same to watch these scenes where every cell phone is a potential trigger and every twitching curtain a possible sniper. Here, the undulating sand conceals wires that snake towards homemade science experiments as unstable as they are lethal. Explosives are strapped to the living and lurk unseen inside the bodies of the dead. But though studded with bravura set pieces—an unwilling suicide bomber trapped in a deadly vest, a desert ambush alongside British sub-contractors—the movie is less concerned with the unfolding of events than with the nurturing of atmosphere. Neither as self-consciously experimental as Redacted nor as confrontational as In the Valley of Elah, The Hurt Locker observes the routines of its little band of brothers (there are no women in this Army) with unwavering focus. The accretion of suspense is organic and remorseless, egged on by a jonesing camera that lapses, without warning, into blissed-out slow-motion. As the men snipe at suspicious shapes and snip malignant wires, the filmmakers create a perpetually labile environment, a trembling oven filled with skeletal cars and haunted by mangy cats. The overall effect is unexpectedly vivifying, the proximity of death exciting the will to live, and Bigelow—who has never been ashamed of her pop sensibilities (long before Twilight there was Near Dark)—revels in the action as much for its own sake as for its psychological revelations. At times it seems as if the movie’s blatant addiction metaphor could just as easily be applied to its maker. More than anything, The Hurt Locker is a high-wire study of men at work, its lack of overt politics replaced by a revelatory central performance. Arcing his character from borderline crazy to something infinitely more complex, Renner moves James from objectionable to sympathetic with astonishing skill. Late in the movie, when we see him lost in the cold abundance of an American supermarket with his wife and child, his eyes tell us his heart is elsewhere. That’s when we realize The Hurt Locker isn’t a war movie at all: it’s a love story.